From Goodreads ~ Find the answers to hundreds of life's most perplexing questions in this entertaining collection from the editors at Portable Press (the team behind the best-selling, award-winning Uncle John's Bathroom Reader line). 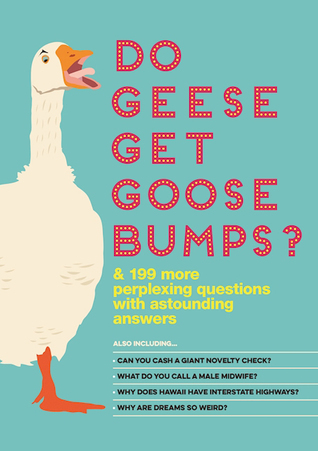 "Do Geese Get Goose Bumps" is 224 pages of simple explanations for complex topics - everything from "Why is air transparent?" to "Why do late-night commercials always offer to throw in a second, identical product 'at no extra cost'?" Can an elephant cry crocodile tears? What's in a hot dog? Why does Hawaii have interstate highways? What did they call a photographic memory before the invention of photography? Why does Superman wear his underwear on the outside? Why do dogs come when you call them, but cats ignore you? What's a male ballerina called? This book has 199 questions and answers to some of the things you have probably wondered about. 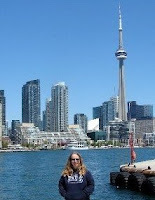 And it was interesting to read about the stuff I hadn't wondered about too. I like these books because the information is bite-size, informative and great when you want to know something about something but you don't want to know too many details. They cover things about around the house, geography, history, wild animals, domesticated animals, fashion, government, technology, myths & legends, science, food & drink, sports, at work business, entertainment, language and the human condition. A couple of things I found especially interesting was how Columbia record club worked (yes, I had enrolled in their CD and DVD plans years ago) and whether TV courtroom shows (like Judge Judy) are legally binding.